Adam Larsen took this picture the night Obama and the Obamalac came to Des Moines to declare victory over Hillary last summer. After giving his speech his SUV roared by and I could see his out-stretched arm poked at me. Adam sent it to me tonight so here it is. Deb Halvorson won her race for the US House Nov 4 with Obama's help and I'm proud to have supported her. 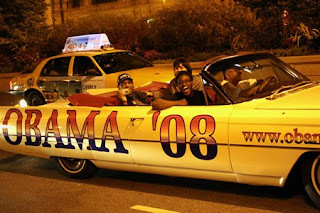 This is a video shot during the Sep 2008 Joliet IL Black Pride Parade. This pair shared in the tremendous joy of the Obama victory celebration! 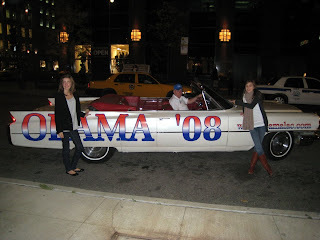 Mother and daughters enjoy riding in the Caddy on a warm summer-like night made even better because of the election night victory in the air! Meggie, Julia and Candace say hi to all from France! These three were some of the first riders and they had fun! Oh what a night. Kathleen Duffy took this pic before the Irish Couple came onboard. Had the FCC, Pinkertons, and someone in Peking, China checking out the blog this week. I will still play Steve Earle! French Family Shares in the Victory Celebration! 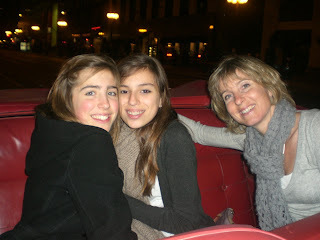 On an implulse I invited this french family to share the excitement and join in the cruise on Michigan Avenue. They started a night of memories that will live forever in my mind. They sent some pics and a note. Ed Scanlan from Chicago sent this pic in. I’m still trying to absorb all of this. There are so many things to contemplate, many of them personal. The fact that I’ve known him for years, even since before he was elected to the Illinois Senate. The private conversation we had long ago when I tried to discourage him from running for the US Senate. Our chance meeting on a public golf course when my then girlfriend swooned and I told her she was nuts. His remarkable primary victory and the whacky season it sparked (Blair, Jack and the Martian). My chuckling at his nickname for my formerly staunch Goldwater Republican and formerly all too white father: “Brother Miller.” My embarrassment at my father’s first words to Obama when I introduced them in January of 2004: “Never change. Never change,” and my concern at how Barack will, eventually change. His call to me during his failed congressional bid wondering why I was being so harsh and his attempt at rapproachment, when I first realized how skillful he could be. The fact that my wife is an Iraqi-American and my concern about what this election will mean for her family and her former nation. On and on. It’s kinda weird “knowing” a president-elect. It makes you think back, as well as look forward. Cierra Hall sent in this pic from Michigan Avenue. Just noticed that someone from Wasilla AK checked out this blog! Suppose Governor Palin is checking out President-elect Obama? Donna Oppolo sent in this picture. Must have been a story about the OBAMALAC in the Turkish press because there's been hits from around Turkey. Welcome! I went down Michigan Avenue about 6 pm just to see the people flowing into Grant Park to hear President-elect Obama give his speech. The crowds and traffic forced me to stop and the cell phones came out taking pictures. A couple speaking french approached the car and on an impulse I asked them to join me. (Our kids live in San Francisco, Dallas, Carbondale IL, Springfield IL and Geneseo IL and they all worked and couldn't share this experience.) The couple flew from Paris with two kids to participate in the celebration. 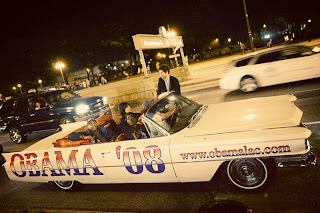 We cruised Michigan Ave while the crowd roared with positive response and laughter at the over-the-top OBAMALAC. When I dropped them off three Chicagoans joined me. With the strength of youth, release of 300 years of frustration, and bubbling jubilation they started chanting "O Bam Ma, O Bam Ma...." to the crowd. Arms in the air, smiles on their faces, JOY TO THE WORLD! At some points the crowd was 8 or 10 people deep and blocks long snaking up, then back down and then up Michigan again. The crowd joined in the chants and cameras clicked everywhere. With my CD player and five speakers booming out classic Rock and R & B we had a great time. 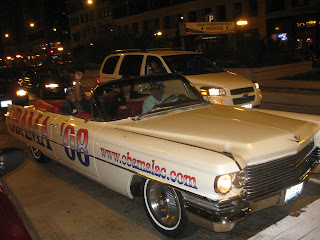 For a while we had a photographer from the Chicago Sun-Times as a passenger snapping pics. My oldest son has a column in the Times and maybe that precluded publication of any OBAMALAC pics. He used to live at the Doral (151 N Michigan) and that was my northern turn-a-round. We went south to 12th or 14th street and came back. We saw many of his friends and some called or texted him. The combination of victory, fabulous weather for November, slipping schedule, and boredom with an endless, slow moving line created energy that needed release and we gave it to them! For four hours!! Passengers were added and changed all night. A couple from Ireland, more from Chicago, one guy from New Zealand, and such. Reporters from Finland, Belgium and elsewhere grabbed info from us. At about 10:15 the crowd closed in from BOTH sides of the street and stopped traffic from moving at all. On our return trip the cops shut off Michigan Ave by pulling a car and barricades in front of us. The steam left. I'm a great-grandfather and been around for a while but this night was like a dream. A positive, joyous night like no other could ever be again! Pictured are just some of the spirited people who turned out today to ask those attending the parade to vote for Halvorson and Obama in November! They are such a positive group. IL state Senator Deb Halvorson is running for the US Congress in the 11th District. 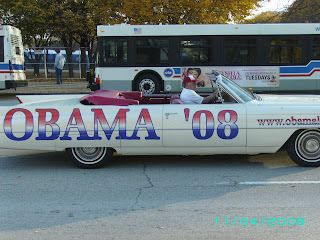 She is shown here in the Obamalac just before Joliet's Black Pride Parade today. She has been a strong supporter of Sen Obama and I hope we can return that support and help win her race. We joined with the Scott County Iowa and Rock Island County Illinois Democrat organizations for the parade in East Moline, IL. I wanted to write "VOTE OFTEN" on the sign but my Chicago son would not like it! We are providing a new home for the Obamalac. A garage 40 foot deep for the big Caddy! It is taking longer to move than I anticipated but we will be ready to go to the Democratic Convention in Denver!! 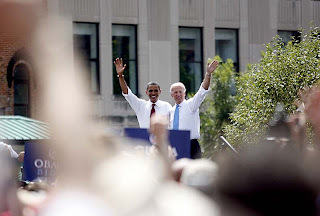 Barack Obama will officially be the Democratic Nominee for President of the US! 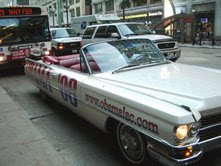 The Obamalac is back in the shop for transmission leak repairs. We will be in the parades in spirit. Last year it was Bettendorph Iowa and Rock Island Illinois. I wanted to go either there or Sycamore Illinois this year but repairs come first. 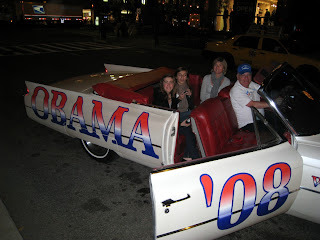 I promised Hillary a ride in the Obamalac if she drops out before Saturday! 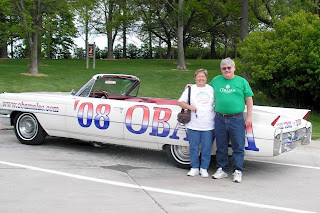 Kris and Greg Kroener of Geneseo, IL posed by the Obamalac at a rest area on their way to the Obama Rally in Des Moines 20 May 08. We have won an absolute majority of all the delegates chosen by the people in this Democratic primary process as of today! No imaginary counting, nor wishful thinking, just total numbers won by the rules. This country will not have a third Bush-Boy term so the next president will soon be Sen Barack Obama! 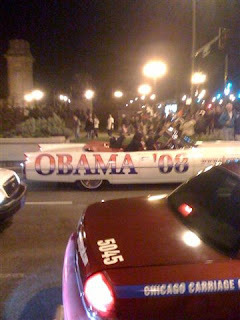 The Obamalac is parked near the Iowa Capitol Building today overlooking the gathering crowd of people here to listen to Sen Obama talk about another victory in the primary process of 2008. Our last trip back on 3 January ended in a victory celebration! It was a with a temperature of MINUS FOUR degrees and without a heater blower. Forecast is 70 degrees above zero and sunshine for tomorrow. The car has been in several repair shops getting the transmission rebuilt and the electrical system repaired but it is now ready to roll. We're just 16 pledged delegates away from reaching an absolute majority. So I'm returning to the site of his real victory for a change! 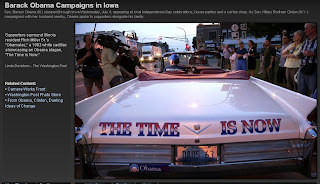 The primary will be book-ended by Sen Obama in Des Moines, 20 May 2008!! It's not going to be an easy ride but the trip will make him a better man in the long run. He isn't riding for himself-he is riding for all of us!!!!! RIDE ON. PLEASE NOTE: The transmission is being rebuilt and they have had problems getting parts. 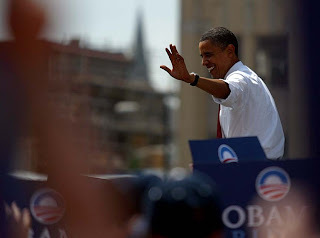 I had planned to go to PA and still hope to get to Indiana and Kentucky in support of Sen Obama. 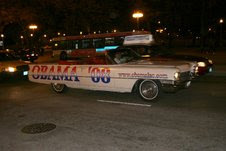 A year ago I took my 1963 Cadillac convertible to a graphics shop in Rock Island,IL with an idea. I wanted to make a statement of support, of pride in Barack Obama and his effort to become our next president. I despised the fact that so many "fortunate sons" just waited their turn at this role and I knew he was not one of those. 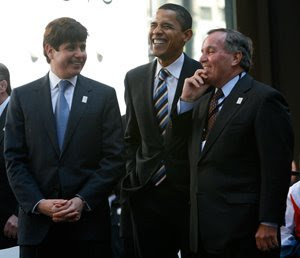 When Obama started running for the US Senate he came to the IL Quad Cities many times and I found he was an easy guy to know and like. And he still is. The graphics people asked how big to make "OBAMA 08". After indicating the size, they measured, came up with proposals, made the decals, and placed them on the car just in time for my trip to Springfield Illinois for Senator Obama's official announcement for President 10 Feb 2007. 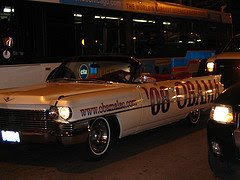 It was such a hit I added it to the other side and to make it fit it became "08 OBAMA," next came "The Time Is Now" across the trunk. 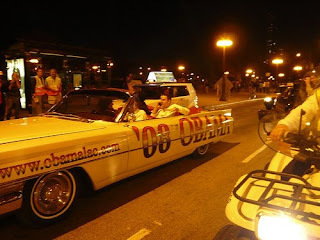 Since then I've been in many parades in both Iowa and Illinois and at many of his appearances and Michelle's too. Horns beeped and people smiled and waved everywhere we went. It's unbelievable how many people pulled alongside of the car on the interstate and highways and took cellphone pictures. Magazines and newspapers had pictures of the Obamalac. The best was the US News and World Reports July 16, 2007 issue. The first page, the index, had a picture of the Obamalac taken at Fairfield Iowa and again on the two-page title page of the cover story, "An Election Like No Other," (with pics of Rudy, Hillary, Mitt, and the Obamalac). It serves as a great non-competing stand-in! We have five sons and the fourth one has a 57 Cadillac Eldorado convertible that is really sharp. It's visiting while waiting on a part. It was minus four degrees Thursday morning, the day of the Iowa caucus victory and our cold ride (heater motor dead and back window out), and sixty-three degrees today! The car is now clean and "fired up and ready to go!" His smile is as big and wide as my Cadillac! Over the years I've seen him many times and at many places and never once did he show the pompous attitude displayed by many politicians. I've never seen him treat anybody in a rude or conceited manner which is so common with today's politicians. I just hope there's someone watching over his young staff so they don't become arrogant, lazy, and contemptuous of the voters and supporters because of their candidates win in Iowa. I really respect this lady. She keeps him happy, healthy, and grounded to the real world. She makes Barack take out the garbage from the house sometimes. She will make sure the garbage doesn't return to the White House! Victory! What an experience! What a long way he has come. And the rest of us too!! The lady has voted Republican and Independent but this time she voted for Obama and "change you can believe in." She was given the honor of introducing him tonight. The crowd was so loud I couldn't hear her name. Bob is trying to catch up on his text messages and cell phone calls. New Hampshire calling? He needs to find time for a barber. Maybe John Edwards could loan out his! for Obama's arrival. At long last the Iowa Primary is OVER and he has WON! The Obamalac was inside the Hy-Vee Hall for the JJ Day Obama Speech to his supporters before the dinner but his staff just couldn't get it inside this time. To bad, because that floor space just sat empty. I parked at the rear (press entrance) and saw these youngsters admiring the car. I wasn't surprised to meet two more, smiling, inquisitive Aussies! I have never met one that didn't bring light into life! I believe they are from Kellyville, New South Wales. This election year screamer was outside the building when the cops came to check it out. He calmed down a little and walked away but the press followed. BTW, the Howard Dean "SCREAM" was fabricated by the press using a directional microphone. I talked to several people who were in the hall that day and they couldn't believe the injustice as there was no "scream." They got him good. They will probably put it in his obituary. Senator Obama had the Davenport office staff come up and gave them words of thanks and honor by name. Here are two of the best, guys you could always count on when needed. Adam Hoyer is in the jacket and Tripp Wellde in blue. They were always pushing to get needed things accomplished. We can be proud of their work, high standards, and expectations! On a bitter cold day in Davenport the Obamalac went with the top down to Friendly Hall for his final primary stop in the area. I was working on his behalf in the primary election for senate when so few people showed up in Rock Island I called one of my five sons (the only one living in the area) and his co-workers to come over on their lunch hour because the room was bare! Not a problem today!